It is hard to put into words our experience in Phnom Penh. We were there for only two days but moved by its history. In those two days we visited S-21, the killing fields, shot guns, and practiced yoga at NataRaj yoga. There was a devastating genocide which occurred only 30 years ago. Over 2 million Khmer people were killed. 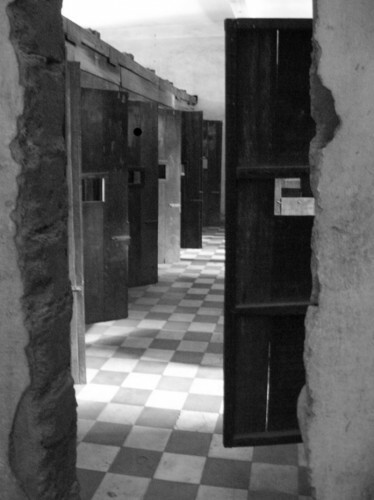 Many were tortured at S-21 for 3- 6 months only to be inhumanly killed and thrown into mass graves. Mothers, infants, brothers, sisters, fathers, whole families were killed. The trauma can still be seen on the faces of Cambodians today. Though difficult to experience, it is important for us to be aware of this event. Walking through S-21 and the killing fields keeps the memories of the victims alive. Please take a few minutes and educate yourself on the events in Cambodia by clicking on the above websites. But there is hope! Organizations such as NataRaj and Rainbow Orphanage provide hope, skills, and comfort to those who suffered the most from these traumatic events. One of the classrooms at S-21 that was turned into many single cubed cells. It did not feel appropriate taking pictures at the killing fields. Shooting guns was Sebastien’s idea. Another interesting experience. In Cambodia you can shoot a bazooka for $350. Have you seen Rambo yet? I have read all of your blogs. I must say I am impressed. You are experiencing quite a journey.